During 2016-17 we worked on seeking re-accreditation for our Professional Development Framework. In doing this we looked at how we could enhance our framework and in particular focussed on simplifying and clarifying our processes and further strengthening the support that is in place for colleagues. We are pleased to be able to confirm that following a successful HEA outcome (in which the University was commended around several areas of good practice), with effect from 1st September 2017 we are now working with our new RELT Framework. We are now delivering monthly workshops and if you are interested in progressing HEA Fellowship Applications through our Professional Development Framework then you should sign up to one of these workshops: Recognising Excellence in Learning and Teaching (RELT) – UKPSF/HEA Recognition Workshops. RELT (Recognising Excellence in Learning and Teaching) is the University’s Professional Development Framework for teaching and supporting learning in Higher Education. It encompasses our PgCLTHE and CPD programmes and it is accredited by the Higher Education Academy providing external and independent confirmation that these programmes are aligned with the UK Professional Standards Framework for Teaching and Supporting Learning in Higher Education (UKPSF). It provides participants with the opportunity to be professionally recognised through the Higher Education Academy’s fellowship scheme. The framework (aligned to the UKPSF) illustrates how University colleagues can ensure their professional practice is UKPSF/HEA recognised either through the Post Graduate Certificate in Learning and Teaching in Higher Education (PgCLTHE) taught Programme and/or the Continuing Professional Development (CPD) Programme. The PgCLTHE provides AFHEA and FHEA recognition and the CPD Programme provides AFHEA, FHEA and SFHEA recognition. In Higher Education many of us have a dual role in terms of our professional identify and practice. We belong to a particular discipline and in many cases that involves belonging to a professional body. We also have our professional identity and responsibility in terms of our teaching and supporting learning practices. The UKPSF is the framework that relates to our professional role of ‘teaching and supporting learning’ in Higher Education. The UKPSF is a nationally-recognised framework for benchmarking success within HE teaching and supporting learning; it is managed and lead by the HEA who see it as essential to driving improvement in, and raising the profile of learning and teaching in HE. The Higher Education Academy (HEA) is the national body which champions teaching excellence. They work with governments, ministries, universities and individual academics in the UK, and around the globe. They provide value to the HE sector by focusing on the contribution of teaching as part of the wider student learning experience. professional values that individuals performing these activities should exemplify. There are four descriptors within the UKPSF each having a related HEA recognition. The following provides a general overview relating to each descriptor and identifies those roles (which may be typical of some individuals) able to evidence meeting descriptor criteria. Early career researchers with some teaching responsibilities (e.g. PhD students, GTAs, contract researchers/post-doctoral researchers etc.). Staff new to teaching (including those with part-time academic responsibilities). Staff who support academic provision (e.g. learning technologists, learning developers and learning resource/library staff). Staff who undertake demonstrator/technician roles that incorporate some teaching-related responsibilities. Experienced staff in relevant professional areas who may be new to teaching and/or supporting learning, or who have a limited teaching portfolio. Demonstrates a broad understanding of effective approaches to teaching and learning support as key contributions to high quality student learning. Academic-related and/or support staff holding substantive teaching and learning responsibilities. Experienced academics relatively new to UK higher education. Staff with (sometimes significant) teaching-only responsibilities including, for example, within work-based settings. Demonstrates a thorough understanding of effective approaches to teaching and learning support as a key contribution to high quality student learning. An experienced member of staff able to demonstrate, impact and influence through, for example, responsibility for leading, managing or organising programmes, subjects and/or disciplinary areas. An experienced subject mentor and/or someone who supports those new to teaching. An experienced member of staff with departmental and/or wider teaching and learning support advisory responsibilities within your institution. Demonstrates a sustained record of effective strategic leadership in academic practice and academic development as a key contribution to high quality student learning. Highly experienced and/or senior staff with wide-ranging academic or academic-related strategic leadership responsibilities in connection with key aspects of teaching and supporting learning. Staff responsible for institutional strategic leadership and policymaking in the area of teaching and learning. Why Apply for HEA Fellowships Recognition? It demonstrates National recognition of your commitment to professionalism in Learning & Teaching in Higher Education. Demonstrates that your practice is aligned with the UK Professional Standards Framework (2011). Provides an indicator of professional identity for HE practitioners, including the entitlement to use post-nominal letters – AFHEA, FHEA, SFHEA and PFHEA. It is a portable asset with UK-wide relevance, increasingly recognised by HE (and FE) institutions. It is an opportunity to gain recognition for the work you do in the teaching and supporting learning of students. Many advertised posts in UK HEIs now specify HEA recognition for appointment; in some Institutions it may be a requirement for promotion. More Institutions see Fellowship Recognition as an essential requirement for colleagues involved in teaching and supporting learning. Your institution gains benefits from being able to claim its staff are appropriately qualified and recognised and your achievement can be recorded as part of the institutional Key Information Set (KIS) data. It is the responsibility of individuals to ensure they remain in good standing within their discipline and this is the same with the UKPSF. It is implicit within the framework as well as a requirement of the HEA that all fellows remain in good standing and continue to work in line with their relevant Fellow descriptor standard (as outlined in the Framework) and the Fellowship of the HEA Code of Practice. Adherence to the code and a commitment to professional development are crucial to gaining and maintaining fellowship of the HEA. All colleagues are encouraged to record their professional development activity and it is particularly important that Fellows do this to ensure that they remain in good standing; a University requirement within the CPD Programme to fellowship is to include within the application a tailored CV which details relevant learning and teaching CPD. It is important to ensure that CPD underpins your career in teaching and/or supporting learning beyond the award of fellowship and the University is fully committed to the development of its staff and has in place an extensive offer of CPD. This is continuously reviewed and revised in light of emerging agendas and staff requirements and is aligned as appropriate to the UKPSF. Please note the Participant Guide will be made available to colleagues once they have attended the workshop: Recognising Excellence in Learning and Teaching (RELT) – UKPSF/HEA Recognition Workshop. Future sessions of the workshop are available here. The University’s Professional Development Framework: RELT is managed by the Learning and Teaching Enhancement Team within Academic Registry; Nicola Poppitt is the Academic Lead for the Framework. The PgCLTHE and CPD Programmes within our Professional Development Framework have External Examiners. Dr John Bostock (PFHEA) is the External Examiner for the PgCLTHE Programme and John Lea (PFHEA) is the External Examiner for the CPD Programme. Our University resources to support colleagues progressing fellowship applications via our CPD route will be available here once we have received notification with regards to the HEA decision around our reaccreditation. If you enter LAT4002 or LAT4003 as the search term this will take you to some relevant reading lists; just go into the latest version. Other colleagues have found these lists useful in completing applications. 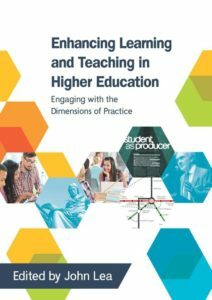 is an essential guide if you are working in higher education and seeking professional recognition for your role in teaching and supporting learning, and particularly if you are seeking a fellowship with the UK Higher Education Academy (HEA). The first of the five documents is a general guide to assist colleagues in thinking around the sorts of activities which relate to the UK Professional Standards Framework for teaching and supporting learning 2011 (UKPSF). The further four documents are quite similar in content but are tailored to reflect the area identified. The HEA Resource Centre provides a wealth of information, research and support material that will help you in your professional practice. The HEA have four identified workstreams to help you more easily locate the resources of interest to you. These include: curriculum design, innovative pedagogies, student transitions and staff transitions. Promoting Teaching: Making Evidence Count provides a useful framework which colleagues may find useful to draw on in helping them to complete their fellowship application particularly around types of evidence that could be drawn on to support their teaching activities.